The resulting value is pretty remarkable. For example, the retail cost of all the products in CS5.5 Production Premium (if purchased separately) is $6,641. Just for After Effects CS5.5 alone, the normal price is $999 and the education price is $349. But here with this special, you can get Adobe After Effects plus six other major CS5 applications bundled together (including Premiere Pro and Photoshop Extended) for just $379. 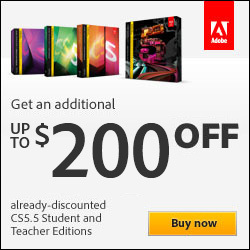 Even for countries not participating in these special promotions, or after the offers end, the Adobe Student & Teacher Editions are a smart and safe bargain. They are available in: Australia, Austria, Belgium, Canada, Denmark, Finland, France, Germany, Ireland, Italy, Japan, Luxem­bourg, Netherlands, New Zealand, Norway, Portugal, Spain, Sweden, Switzerland, United Kingdom, and the United States. For commercial customers (non-education), we’ve got a different set of coupon codes where you can now save 50% on full CS5.5 Premium suites. The academic discounts are available until 11:59pm (PST) on Thursday, March 15, 2012. The software must be purchased through the Adobe Education Store, and your product can either be downloaded instantly or delivered via box. Valid in the U.S., Canada (excluding Quebec), and Mexico, for Student and Teacher Editions only. Savings are limited to one discount per customer per product. Discount must be applied in a single transaction and is not available retroactively. Offer is valid for qualified education customers only. Not valid for subscription, OEM, or volume licensing products. This offer and prices are subject to change without notice. seems very unprofessional to pull the earlier deal that was clearly advertised. Hi AR, about the previous SAVE80EDU coupon code being canceled – certainly it was regrettable that happened, but it was clearly a mistake… Adobe’s education editions are already 80% off the retail price, so a second 80% off doesn’t make sense – it was a duplication error and not what was intended. And so some have said their orders did not go through. Adobe (like most companies) always says, offer and prices are subject to change without notice. It actually says the same for this new offer code above… So again, sorry – but that can happen! So the offer ends on March 2nd? Is this a good clue that could possibly hint at that CS6 will most likely be coming out over the next 2-3 months? Of course it is all speculation until Adobe officially releases a statement. From what I’ve heard about it and based on common business strategies, Adobe does this in an attempt to sell as much software as possible before it becomes proprietary. Also, after talking to an Adobe rep, he/she estimated that CS6 will be released “soon” and that it would most likely come out sometime between “now and in the next 3 months” (this is still super speculative and he/she took a great risk by telling me this). So shout out to that rep and the customer service, I really appreciate it. It seems to me that the release date being within April or March is looking pretty good, but I’m sure we’re all going to be freaking out like crackheads until we officially know when we can get our Adobe fix (in the form of CS6). Thanks. When Will Adobe Creative Suite 6 Be Shipping? Hope this helps and thanks again for stopping by. I asked several times but maybe you can answer this question: when will the student and teacher editions will be available in Serbia? I know students do not have much money in US and UK, but imagine in Serbia. Hello Bojan, good to see you again. We can’t say for sure when Adobe will expand to the rest of the countries in Europe… But, they are always growing – and the list of geographies is always getting bigger. For example, when we first became Adobe partners in 2006, less than a dozen countries in Europe were covered and not that much in Asia. Now Adobe realizes that much of the future growth will come from these newer markets, so it’s only a matter of when… But it does take time, investment, and resources for each new country, language, currency, etc. Thanks for the info. Fortunately, I’ve already read that article and even if they are just estimations, it’s awesome you give a time frame with a small window of when it will most likely be released. I appreciate how informative you guys are and how well you keep up to date. Definitely a very helpful and reliable resource in the developer world. I guess until Adobe starts taking the wraps off of CS6, we can’t know anything for certain about it. Hopefully the estimations (sometime in April/May) are correct (they seem pretty logical and based on Adobe’s proposed release schedule they should be pretty spot on) and we’ll see it soon. Thanks for the kind words GM, glad to be of help — and stay tuned! Win Adobe CS6 Master Collection Suite FREE! ($2,600 Giveaway) Amazing Adobe Coupons: Half Price on Full CS5.5 Premium Suites!